The sky was cool glass. A giant cloche had been placed over the world and only sunlight breathed into it, at least that was until I stepped onto Blackheath. There is always a breeze on Blackheath, no matter how hot or still the day the world never stands still up there. The roar of the pulmonary A2 is never far away, but it loses the fight for dominance amongst all this grass and sky. Caught at the right moment, you can get nearly all of it to yourself. I had set out that morning with a thin desire to go past Gounod’s house. ‘Go past’ is incorrect. I have been past it many times, this morning I intended to notice it for the first time. It is a Georgian villa tucked away in a suburb southeast of the heath. I run through the area quite frequently. It sits between the A2 and the South Circular and once you are there, you would never know that either road existed, or even that you were in the twenty-first century, barring a runes-throw of cars and streetlights. You can run in the centre of the road where there is no camber, do a mile and a half, snaking one’s way up to the heath and you will be disturbed by perhaps only one car. It will be so polite and quiet that you probably won’t need to move aside to let it pass. It is the interloper here, not you, for we are no longer in the twenty-first century. The houses! There is little or no uniformity. Bomb damage from the war probably accounts for a number of the newer builds but altogether these houses look like they have mad wives locked up in them, or jewel thieves disguised as Lady’s maids awaiting the right moment to swipe, or illegitimate daughters planning to marry back their stolen inheritances. 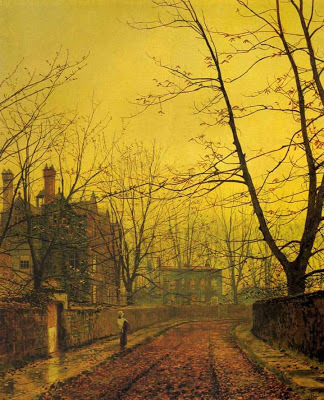 These houses belong to Wilkie Collins, Mary Braddon, Charles Reade, Dickens even, and they always remind me of Atkinson-Grimshaw paintings – perhaps because his work is so often used on their covers as classic editions. The paintings (and the houses) have a sub-Turneresque quality, with a clearer and more distinct line, and they are nonetheless decidedly odd. Turner could turn his hand to almost any visual language. He was a stylistic polyglot. The Turner that we talk of when we say ‘Turner’ tends to be late Turner, the one that depicted snowstorms, hostile rainclouds, steam trains crashing through dense landscapes like raging bulls, all in barometric vortices of light, paint and colour. 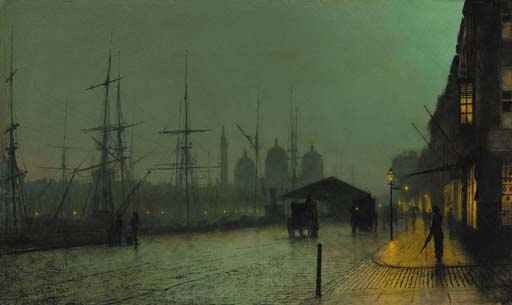 Atkinson-Grimshaw’s paintings are less emotionally ambitious but what is queer about them is their light and setting. The streetscapes that he would become well known for are always defamiliarized through colour. Docks, roadways, houses take on the hues of pond-slime brown, nicotine yellow, or that dirty emerald that became the pallette for Tretchikoff’s retro-trendy green lady that disturbed me from many a wall as a child. The paint always looks dirty. Horse and carriage tracks in which water has collected reflect the deadening glare and suggest life long gone. In the paintings there are always houses from which light spills from the windows onto a rain-soaked street. There is no life, though. The figures, sometimes none, often one, and occasionally many, have their backs turned to us or hide their faces. The houses are closed to them and us. The paintings tell us that we are merely the houses’ observers. The lights are on, somebody is home, but not to us. Real life is elsewhere. There are greater parallels between Atkinson-Grimshaw and eastern Blackheath than you might imagine. Re-read the last couple of hundred words and they describe, with surprisingly few adjustments, what it is like to walk or run through this area at dusk. There are so many striking houses, windows so large they would not fit on any fascia of my flat. All that glass and no one to look out of it. No one ever tends a garden, washes their car, chats to a neighbour, hunches up their drive with a brace of Sainsbury’s bags. I have seen security that guard the entrances and exits to the road from undesired traffic, but never who or what it is that they are securing. I have run these streets probably over a hundred times, and never have I seen someone looking out of these windows. I wonder how different these houses are to the bourgeois fortresses in Victorian sensation fiction, places of confinement, where, like Laura Fairlie in The Woman in White, or Madame Bovary, one might find themselves suddenly and quietly buried alive. In his day, Atkinson Grimshaw was criticised for endlessly recycling the same image, sometimes to order. Exercises in light and colour, his painting thrummed always in the same minor key. But for me it seems that his work represents something else altogether about bourgeois communities. In the paintings, the houses are always walled off from their onlookers. They seem to fight so fiercely for isolation and disconnection; to make-believe that they are not where they are, in central London, but elsewhere. Today we have alarms and fences keep the world out so that their owners can deny their place in the earth, so that they can pretend that their roots reach into some different ground? Towards the northern end of this area is where Gounod stayed when he first came to London. Like the bourgeois characters in Maupassant’s ‘Boile de Suif’ (which we will pop back to on our return – we’ll see how we are for time), Gounod came to London to flee the Franco-Prussian War, and found himself embroiled in a wicked plot that Collins or Braddon would have been embarrassed to use. For those interested, it is on Morden Road (it was ‘8’, but is now ’15’) and it is the house that he stayed in after arriving here, before he and his wife moved in with Georgina Weldon at Tavistock House (demolished) in Bloomsbury Square. Their relationship was probably a platonic one. They knew each other through the opera (Weldon was a celebrated soprano). A decade previously she had married William Henry Weldon and was consequently disinherited by her father. Her husband, though – like her father, refused to allow her to follow a career on stage and she was limited to amateur theatricals and charity concerts. The couple had no children, and by the time she met Gounod, the marriage was failing. 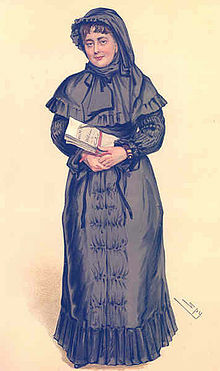 Bored and frustrated Weldon (Georgina) set up a school for orphans and the children of the ‘deserving’ poor. After she persuaded Gounod to move in with her and her husband the two became very close. He was impressed with her vocal talent and he promised her the title role in his opera Polyeucte which he was writing during his stay with them. 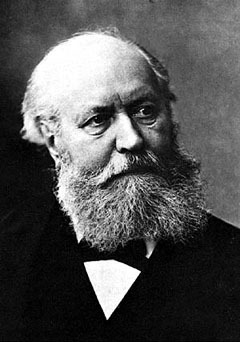 No one knows why Gounod left Tavistock House when he did, but when he returned to Paris Weldon refused to send on his belongings – including the first draft of Polyeucte. The Weldons’ marriage continued to limp onwards. In 1875 they separated but after only 3 years Harry tired of the annual £1000 that he had agreed to settle on her, so he tried to use her interest in spiritualism to prove her insane. If proven, she would have been locked away in an asylum. She was duped into being assessed, forms were signed and they came to take her away. Realising, at last, what her husband’s plan was she escaped and went on the run. The state of Victorian civil law meant that she was unable to bring a case against her husband so she decided instead to publicise her story. She could get into court if her husband tried to sue her for libel. They didn’t. The law eventually caught up with her. The Married Women’s Property Act of 1882 permitted her the freedom to bring a case against her husband. She won. For the next six years she was in and out of court constantly bringing all of those involved in the Weldon Affair to justice. At one point, she had 17 cases going at once and in all of these refused counsel. Her character as a wronged woman, so clean that she was used in a Pears Soap advertisement. 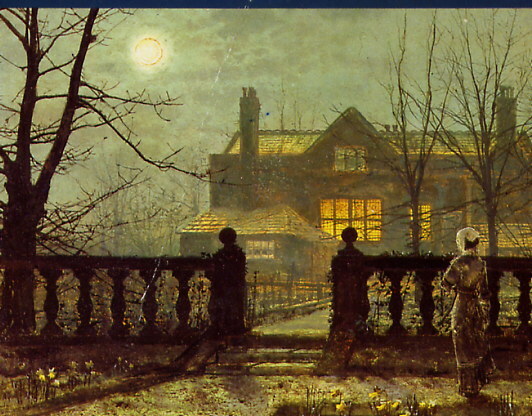 One of the major attacks on the sensation fiction of the nineteenth century, the ones that use the Atkinson-Grimshaw images as covers, was that they were too far-fetched. In the Weldon Affair, via The Woman in White, art had become life. Blackheath at last – where a man scowled at me for looking at his kite. From the fortresses of the past, to one of the future. As you approach from south, the ground falls away from you quite suddenly and there is a view so specific that it looks to have been carved out of the park. It is One Canada Square, or Canary Wharf as it is more commonly known. It is one of those views that appears as if through a magnifying lens. It looks much closer than it is, than it can possibly be. The whole scene is like some anachronistic vision of Humphrey Repton. 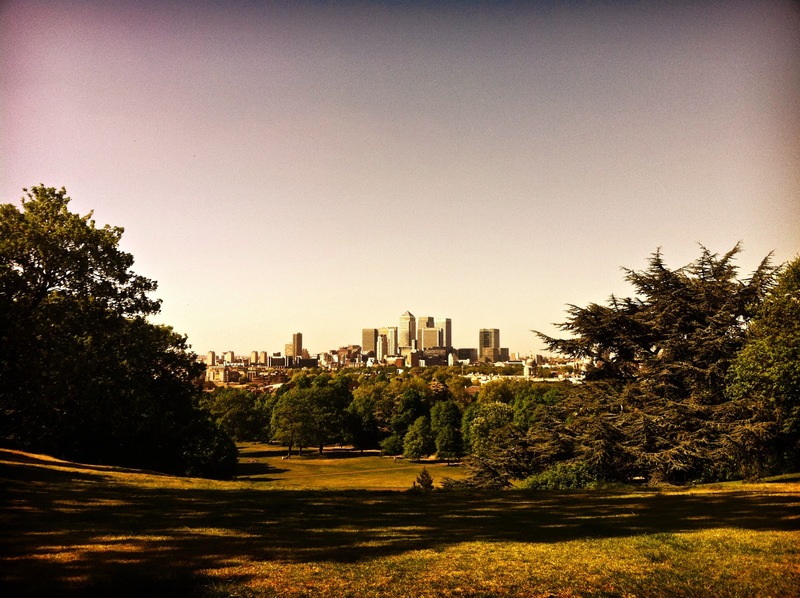 A carefully organized park and woodland from which to view…? Canary Whart. At the Greenwich Observatory tourists crowd around to photograph and record this vision of mediocrity. Steel and concrete blocks built to house London’s manufacturing (sorry, I couldn’t resist) nothingness industry that the country pays billions and billions to preserve. Most of these buildings are characterless, but Canary Whart does belong here. Just like Henrietta Stackpole in James’ The Portrait of a Lady, it has the stench of the future. From a distance it looks like a prison from science fiction. There ought to be guards hovering ouside the tower wearing jet packs. If London were in Star Wars this would be the Death Star. It is not from the future, though – if only it was. Instead, it hails from the 80s; it is firm, robust, solid, shiny. If architecture could be haute-couture this would be its shoulder-pads. True to its toughened pretensions, it thinks rather highly of itself. The tower’s point has a blinking searchlight, either keeping an eye on us mere mortals who dare to look upon it, or ensuring that it can announce its mediocre height in the dark, too. It is not the tallest building in the world, it is not the tallest building in Europe, it is not the tallest building in the UK, it is not even the tallest building in London. Yet it still had the temerity to evacuate on September 11th, like this steely Whart could see itself as a target in the same league as the Pentagon and the Twin Towers. Such a move committed a grave and self-aggrandizing disservice to the memory of hundreds that died that day. The evacuation of the building shuffled for elbowroom that it did not deserve on that day’s overcrowded newsreels. My run was nearly done. I was in the final mile (of 9, I think it was). By the duck pond in Manor Park (shhh… it’s a secret) there is a sturdy iron fence, with a small gate, about shoulder high. As I approached children, fathers, mothers, and their fathers and mothers, all simultaneously appeared, like traffic in The Truman Show, from both sides wanting in- and egress. They were pigeons having eyed a discarded bread roll. I had come too far; I wasn’t going to stop and patiently wait my turn. Without breaking pace, and well out of the way, I leapt and levered myself over the railings, barely touching them. A kid said ‘cool!’ Was that pride I felt, just briefly, to be told ‘cool’ by such a little stranger as I ran off. I wonder if it was at that moment, landing too hard on my ankle, that I gave myself the minor sprain which I have been tending to ever since.